Recently occurred California wildfires are not just affecting those directly in their path but they are affecting millions of residents who are now breathing in the hazardous air conditions. In such a condition, a popular healthcare app turned out to be an emerging hero. Polluted air is a serious concern for many Californian residents. This is an extreme case where even if you’re not in an area directly impacted by the wildfires, you are still at risk as smoke can travel hundreds of miles from the burning site. In such cases, Doctor on Demand, A leading virtual care provider in the US is proving to be a huge help. With this app, it is possible to guide thousands of people on what they can do to avoid any harmful effects from the air. It is providing virtual medical help to people who are suffering from troubled breathing, coughing and skin & eye irritation. Apps like Doctor on Demand are a great option and allow those to stay safe inside their home, while still getting the high-quality care they need — 24/7, including weekends. Due to versatile requirements and ability to assist patients remotely, virtual healthcare app is in a rising demand. If you’re one of those who is looking forward to this as an option, you’ve come to the right place. Or maybe you’ve set your mind on this but not sure what functionalities and features you want to include. In this blog, we evaluate the healthcare app development for you. 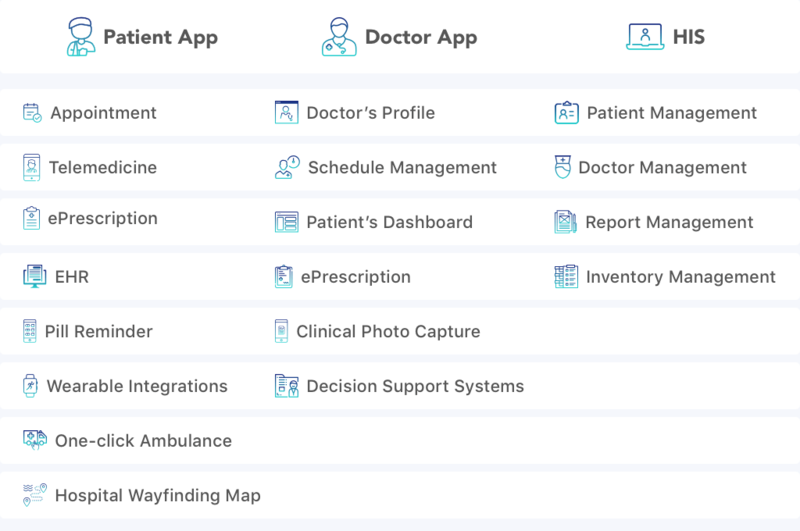 We will see what are the necessary features that you should include in your next healthcare app. Let’s look at some of the prominent features that are important for your healthcare app and discuss them. #1. Appointment: In a world where everything is becoming one-click away, why not book an appointment with a doctor? Booking an online appointment not only saves time by eliminating queue waiting but it is a way more convenient way for both doctors and patients. Step 1: Users registers and fills out the necessary information. Step 2: Select the doctor as per your requirement. Step 3: Select the doctor and book an appointment as per the availability. You may also mention brief information about your problems. Step 4: Once the appointment is confirmed you may view it in the schedule section. Step 5: Before users actually visit the doctor, they have the option to easily upload and share health-related information & documents online. To integrate the appointment booking, there are plenty of API + Webhooks available for you to integrate within the app. One such example is Calendly which gives the custom integration within the product. #2. Telemedicine: Doctors feel telemedicine is an effective way to monitor and treat chronic conditions than the regular 10-minute one-on-one conversation. Currently, healthcare app is drastically changing the way doctor and patients interact with each other in spite of the geographical distance. Step 1: Answer a few questions regarding symptoms. Step 2: Choose an available doctor from the list. Step 3: Choose a convenient time-slot for an e-visit. Step 4: Receive an e-visit confirmation from a doctor. Step 5: Make a video/voice call at an agreed hour. However, for treatments which rely on physical cue needs an in-person examination. This can be replaced with photo-based consultation. This is for treatments like skin problems, bruises, eye infections, etc. In photo-based consultation, the app allows the patients to take a photograph which is stored on a separate server and can be accessed from the doctor’s app only. Further, the doctor can diagnose and message appropriate details to the patients. If more information is required, the doctor may schedule a video call and also send lab test orders via the app. In a survey of medical school HCPs and students, more than 80% of respondents described using mobile devices to communicate with colleagues about patient care via email, text or multimedia message. This clearly demonstrates how critical this feature is for not only patients but doctors as well. For real-time text, audio or video can be powered through WebRTC and cloud infrastructure. You may also opt for Twilio SDK for real-time communication. Dr-on-Demand uses Twilio APIs for facilitating remote diagnosis. #3. e-Prescription: With an e-Prescription feature, doctors can generate and send prescriptions without any errors. This saves time along with improvement in communications and patients satisfaction. This also enables doctors to view prescription insurance formulary information and also comprises all the information in electronically-connected pharmacies. – Generate complete medication list along with dosage and other important details. – This makes it easy for doctors to understand the patient’s history if they have visited any other doctors in the past. – This also streamlines workflow processes and provides more mobility. With an e-Prescription feature, prescribers will be able to write and renew prescriptions from just anywhere. – Tampering with prescriptions is not possible. – Built-in pharmacy look-up for pharmacies providing the particular drugs. e-Prescriptions, when integrated with patient’s electronic health records, enables you to log the information. This helps in creating a detailed view of a patient’s care over time. However, to enable this feature, there are various compliances which you will need to take care about which we will discuss in the architecture section. e-Prescription can be facilitated with Twilio APIs. These APIs can be integrated with the custom product. It can send copies of the e-Prescription through SMS, email or WhatsApp. You may also extend the feature’s usability with remote viewing of medical imaging scans. This works through the uploading and sharing of images through a HIPAA compliant server. In some instances, the remote evaluation of images scans via a medical device has been proven to be just as effective as viewing them at a standard workstation. #5. Pill Reminder: Patient loyalty towards medication and drugs is a critical factor when it comes to the treatment of chronic disease. With the significant number of people relying upon pharmacological treatments. Failure to regularly take medicine and adhere to treatment regimens may adversely affect both the patient outcomes and healthcare costs. – It offers flexibility to customize the schedule as per the requirement of your prescription. – It prevents the errors by making sure that people don’t end up taking wrong medicines or skip dosages. – With this feature, you can also customize the way you are notified. For example, send-a-text, ring, vibrate or a pop-up visual notification. Popular push notifications integrator are Firebase and Twilio. This collects all the data on how the patient is interacting with the push notifications and reflects the progress on the patient’s dashboard. This makes it highly easier for your doctors to analyze your physical wellness. #7. One-click Ambulance: This feature is essential for emergency issues arising in untimely situations. One-click ambulance call can be of great help here. This feature let you request the emergency help for yourself, friends or family. This feature notifies the trusted contacts and the hospital along with the precise location. Additionally, you can also find nearby laboratories and pharmacies to seek help in the case of emergency. You may also like: How to Build an eCommerce App? #8. Hospital Wayfinding Map: Getting lost inside the hospital is a common problem especially among senior citizens. With multi-speciality infrastructure, losing out on the direction is understandable. This feature makes it easier for visitors to find everything from their physician to their parking spot. By providing maps and images to the visitors, it is easier for them to find their way around the hospital, thus reducing anxiety. – Parking help on their cell phones. You may also place kiosks at various spots around the campus. Smart features such as “The Car Saver” function which saves the visitor’s parking locations and provides detailed directions back to their spot. – Indoor positioning within one to two meters. This navigation platform also assists users with visual landmarks and off-route notifications. – It can also send relevant location-based text messages pointing to a specific ward/doctor. Moreover, you can also opt for automatic check-ins, queue placement, check-out and lot more. It also offers guidance to reach you to the department or room you want to visit and help reduce missed or late appointments. The possible technology suggestion for enabling this features are beacons and geofencing. #1. Doctor’s Profile: One of the critical aspects of the patient’s journey is finding an appropriate physician. Selecting any out of the list isn’t an appropriate option. 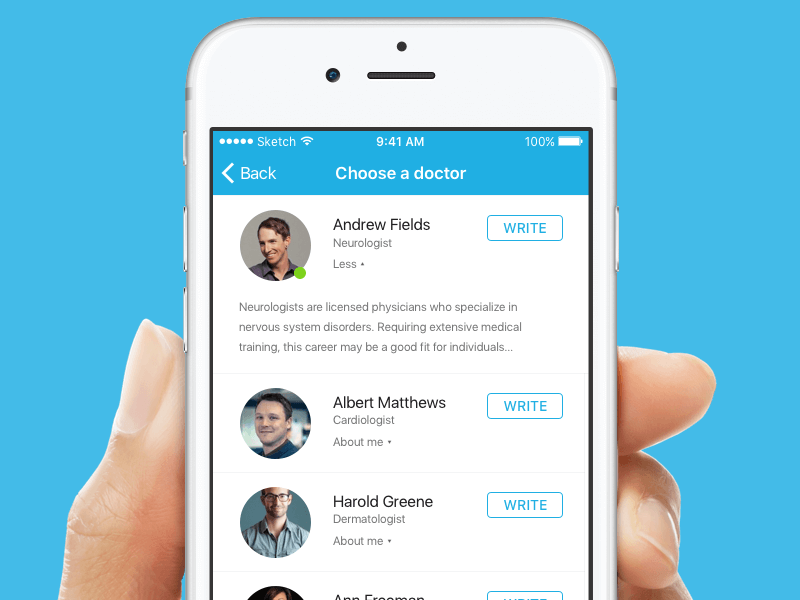 Doctor’s profile saves time for both patients and doctors. This also improves the accuracy of doctor and patient match-making process. – While showcasing the doctor, it is advisable to include the doctor’s expertise, qualifications, professional degrees and certificates, experience and others. – It should also provide the exact location of the doctor including their immediate contact details. – Reviews and ratings from the past users would be an added advantage for first-time patients with that specific physician. – Apart from this, you may also add the physician’s snapshot along with the workplace/clinic. There could also be a recommendation engine built using Machine Learning which suggests doctors based on the symptoms and ailments submitted by the patient. – Doctors can view their appointment requests and types, all this at a single place. – Appointment reminds doctors of their upcoming appointments. – It also has options to view the appointment status. They can also add new time slots for immediate patient scheduling. – They can also cancel appointments by mentioning the reason, if unavailable or have another emergency. – Through ePrescription, doctors can directly send reports and other related documents to their patients. – This feature also showcases the patient queue. #3. Patient’s Dashboard: The patient’s dashboard displays an overview of the clinical as well as personal information of the patient. This page works as a configurable display of critical information related to the patient so as to offer quick and efficient treatment plans. 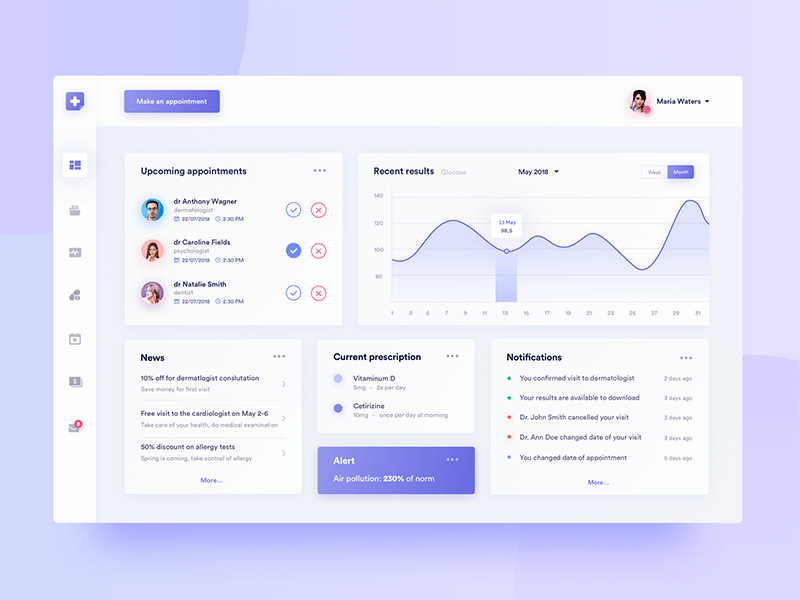 The dashboard may cover information like patient diagnosis history, lab results, nutritional values, vitals, treatments, prescriptions, radiology documents, etc. You may also develop additional dashboards for graphical representation of the trends in medical diagnosis or department specific view of patient clinical data. – Patient information section which includes personal physical details, clinical details as well as demographic details. – Room assigned will showcase the assigned room to the patient. – It also mentions the chief complaints of the patient along with pain level indicator. These details will be updated as needed pre/post doctor’s consultation. – The medication section will contain the current and new medications that have been prescribed to the patient. The drug & dosage, pharmacy, number of refills, the prescription date and current status of each medication. – There can also be an additional section where special remarks pertaining to the patient’s medical history can be described such as immunizations, special diseases, allergies, etc. #4. ePrescription: If you’re not familiar already, this is a technology framework that allows doctors to write and send prescriptions to their patients as well as pharmacies. According to a Surescripts report, 44% of all prescriptions were written electronically in the past year. ePrescriptions works as a decision support tool giving providers an immediate access to an individual’s medication history and details of their prescription insurance coverage- all in order to make better-informed choices. At a basic level, e-Prescriptions work as an electronic reference handbook. 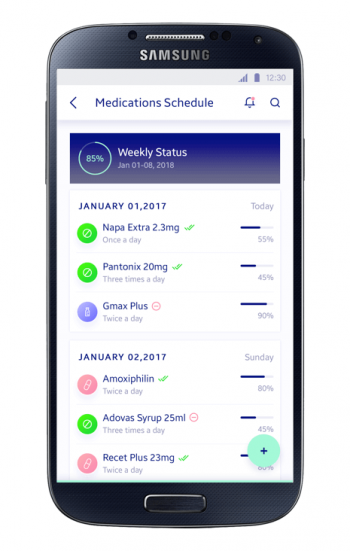 More sophisticated versions can create and refill prescriptions for patients, manage medications and view patient history, connect to a pharmacy or other drug dispensing site and integrate with an electronic medical record system. This feature is one of the most sought after since it reduces the number of prescription errors attributed to bad handwriting or illegible faxes. #5. Clinical Photo Capture: This feature allows doctors to practice high-quality and consistent patient photos in the repeatable process. Furthermore, it helps them to use before and after photos to help convert consultations to procedures and cross-sell aesthetic products and services. – This feature will eliminate the need for expensive and complicated medical photography equipment. – This allows doctors to take photographs from any consultation room using on-screen positioning guides and levelling tools to maintain the consistency. – Customizable photo-sequencing makes sure that the photograph of every patient has the same set of aesthetic prerequisites for the procedure- no angle or position missed. – Also, the photo management system automatically classifies the patient photos by patient name and demography so that it can be used as cosmetic and dermatic documentation. Clinical Photo Capture feature can be built through multi-level security protocols that keep their images secure, track who is accessing the system and the actions being taken with the photograph at any moment. This is a HIPAA compliant service which eases out the time-consuming process of photo management. #5. Decision Support Systems: Mobile apps have turned out to be invaluable tools that support clinical decision-making at the point of care. After every clinical encounter, doctors may not always have answers to the clinical queries. This is where clinical decision-making systems play an important role, especially in evidence-based treatments. – Clinical decision support systems clinicians, staff, patients or other individuals with knowledge and person-specific information, intelligently filtered or presented at appropriate times, to enhance health and health care. CDS encompasses a variety of tools to enhance decision-making in the clinical workflow. – Clinical treatment guidelines may consist of documents specifying the procedure doctors need to adhere while operating/treating specific diseases. – Medical Calculators allows you to enter the values in commonly used formulas to obtain numerical data, such as urinary protein excretion estimation. Other calculators allow you to estimate the severity of a condition such as community-acquired pneumonia in a specific patient based upon the presence or absence of major risk factors. – Laboratory test ordering feature allows doctors to order for laboratory tests. Lab tests when done, results are directly sent to the doctors for analysis. Along with this, you can also build a Laboratory Information System which manages patient check-in, order entry, specimen processing, result entry and patient demographics. The main purpose of the Hospital Information System is to develop and maintain day-to-day records of admission/discharge of patients, list of doctors, report generation, inventory management. Let’s have a look at each of them closely. #1. Patient Management Systems: These combines the medical data and analysis aspects along with administrative tools to help make a practice or hospital more efficient. This system integrated with patient management and health with the medical practice or hospital management. This enhances the patient experience since it focuses on the patient-doctor relationship rather than just illness. This system goes beyond the being an EMR & EHR. It includes appointment management, patient information, room allocation, diagnosis, e-Prescriptions, billing records and more. – Ability to request an appointment with a doctor. – Keeping records of patient’s prescriptions and treatments. #2. Doctor Management: This system allows registering the doctors working in the hospital staff. It helps in the allocation and management of doctors and nurses. All this with complete appointment details with patient health records. #3. Payment Management: With automatic adherence to the appointment system, this system generates the automatic invoice for every patient and keeps records of the payments. This can also help in generating payslips for the hospital staff. Inventory Management: Inventories in the typical hospital environment is managed by the hospital staff in a manual and time-consuming fashion. Such practices are highly prone to human errors. Inventory management system plays a vital role in automating the supply and medication distribution. An automated inventory management systems include technologies for tracking and tracing the inventory and devices used each day in a healthcare setting. This can be incorporated by utilizing barcodes and RFID tags for each along with unique tracking number. You can also add functionality to manage the blood bank along with vital information about their donors. Also, a separate inventory for the automation of medicines. Electronic Medical/Health Record is a system which collects the patient’s data and stores them in a digital format. This system can be shared across multiple different care settings. This reduces the tedious paperwork and streamlines the healthcare workflow. This is a free EHR app designed for physicians so the workflow mimics the way doctors think. This has some distinct features like patient check-in, online form submission, billing software along with e-Prescription system. On-demand doctor apps can be a great help to the patients and doctors both. This can also work as a mobile directory which helps in booking appointments online. 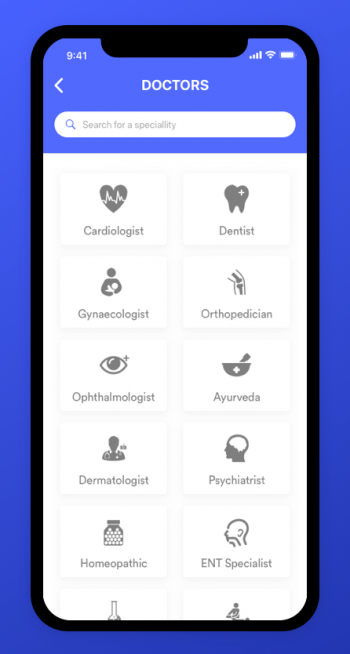 Some of the additional features could be searching doctors based on name, location or speciality, contacting & booking appointments, explore insurance and billing, etc. This provides an online service that gives patients an appointment with a physician, psychologist or lactation consultant via their phone, tablet or computer. It also provides video visits for some common conditions and concerns and all physicians are board certified. If adherence to your medication timetable is an issue due to general forgetfulness, medication reminder apps can help exactly with that. These reminders can be in the form of a vibration or different alarms beeps. This gives reminders for all your meds, times and displays your notes such as “take with food”. Apart from this, one exceptional feature is if you miss a dose, it notifies your friends and family. Symptoms checker helps a layman person evaluate the symptoms of common health problems. With the preloaded health symptoms, you can check the state of your health instantly. With Symptomate you can check the symptoms in three easy steps. Enter the symptoms, answer a few questions and check the results. ePrescription is the method of electronically sending a prescription to the pharmacy. This eliminates the need for a hard write, fax or phone in prescriptions. ePrescription leaves very little room for errors and saves time both ways. 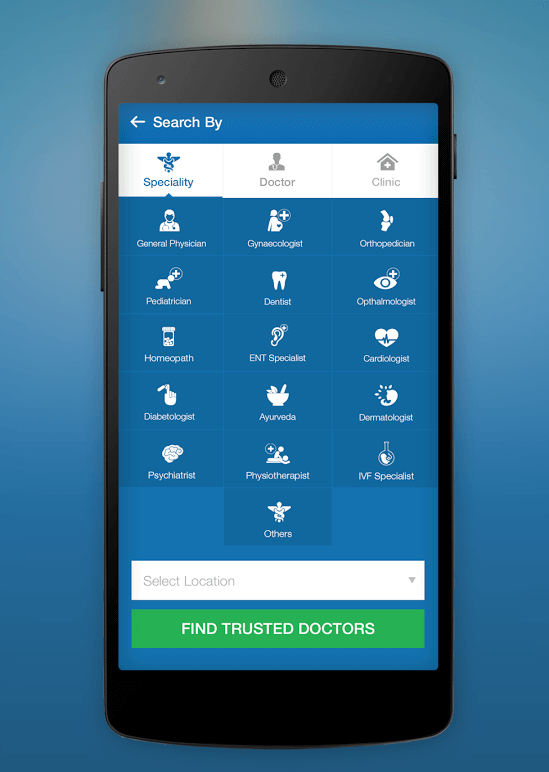 With this app, you can prescribe any drug anywhere from your phone. You can also consult PDMP databases, view medication history and get drug/allergy alerts. There has been a sudden rise in the healthcare application which is focused on specific communities. For example, diet, fitness, healthy eating, mental wellness, etc. This offers a huge food database, listing over 5 million different kinds of foods and ingredients. With its inbuilt calorie counter, you can track your day-to-day calories within 5 minutes. It can be integrated with more than 50 devices including Apple Health and Fitbit. 7 Cups provide anonymous chat for people suffering from anxiety and stress. It provides the confidential conversation with trained volunteer listeners. It connects you with multiple listeners which lets you engage in the guided discussions in chat rooms. As reported by the Center for Disease control & prevention, more than 75 per cent of all healthcare expenses is linked to chronic conditions some or the other way. Under such circumstances, condition-specific apps can be of great help. This is a diabetes management platform which helps you understand how your food intake, activity and medication is affecting your blood glucose. There are types of apps which are focused solely on healthcare and wellness of women. This has been used by over 15 million mothers around the world. You just have to simply enter your baby’s due date and it will track your baby’s growth on per day & week basis. Depending upon the baby’s growth, it will suggest you expert tips and helpful articles. This is a period tracker and ovulation app that uses science and data to help women discover the unique patterns in their menstrual cycle. It lets you track due of the upcoming period, log the birth control and plan for pregnancy. An urgent care app provided by the trusted provider can be a handy tool for people looking help in the emergency. This could be an on-click ambulance, finding and mapping the nearest urgent care facilities and much more. This is an app focused on emergency care. 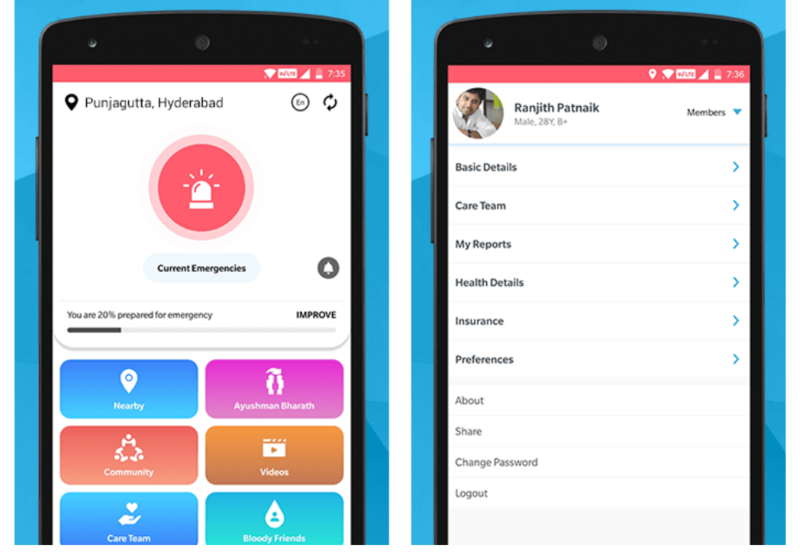 With this, you can call an ambulance in a click and also locate healthcare providers nearby you. 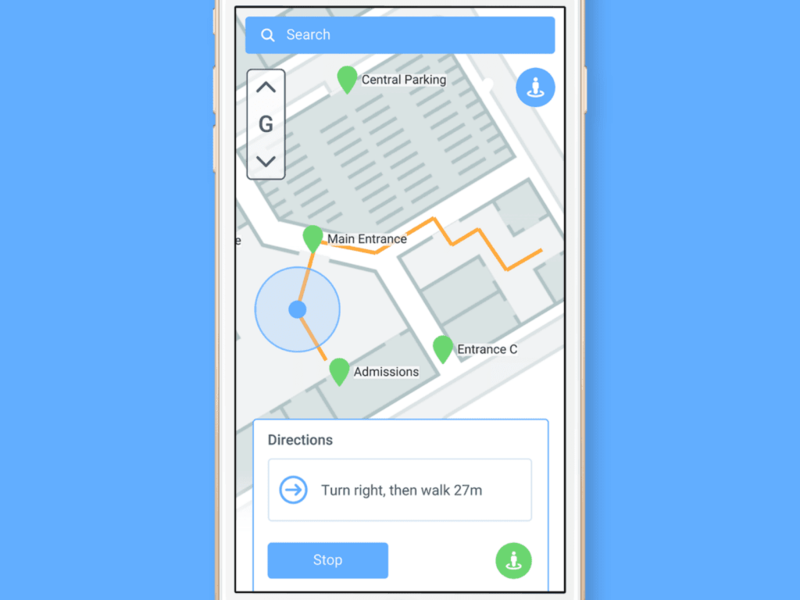 These apps provide indoor mapping platform through indoor turn-by-turn navigation, indoor location-awareness and context-aware messaging to your hospital wayfinding mobile app. This can be also added to the functionality of tagging parking, check-in and more. Wayfinding Apps have a proven record of improving the patient experience. These uses beacons and geofence around the certain structure to give an accurate positioning. Healthcare apps are enhancing the effectiveness of healthcare for both patients and doctors. Due to such inherent benefits, healthcare apps are widely being adopted in doctors and patients both.